Spotify acquires MightyTV. Can its founder fix Daniel Ek’s advertising woes? Spotify has fully acquired startup MightyTV – a content recommendation app that has been likened to ‘Tinder for television’. The platform, which is connected to streaming services like Netflix and HBO Go, presents users with suggested shows for them to watch on TV. They can swipe through them, logging what they liked to help refine algorithm-powered tips in future. So what’s Spotify doing purchasing a tech product which has nothing to do with music? The double-sided answer to that question: (i) it’s effectively shutting it… and (ii) it’s all about making more money from advertising. MightyTV will now be integrated into the Spotify platform to boost its smart / programmatic ad tech. Free Spotify users: expect to be asked ‘do you like this ad?’ with some regularity soon enough. By enabling users to choose which marketing they enjoy, goes the theory, Spotify will be able to serve similar targeted commercial content to individual customers – and therefore present better value to advertising partners. As loss-making Spotify tries to transform itself into a business with a prospect of profitability, growing its ad-funded revenues will be crucial. 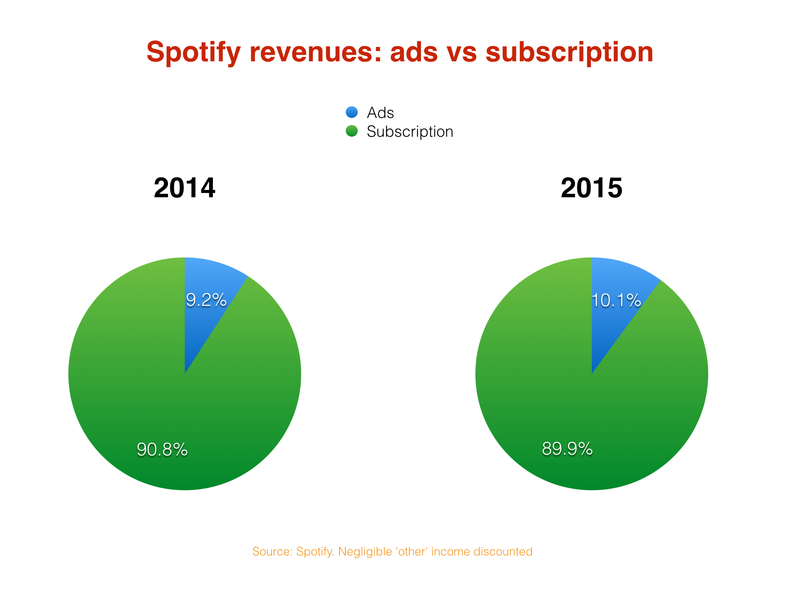 In 2015, the last financial year on public record, Spotify’s ad tier generated $219m (€195.8m) – up 98% year-on-year. However, this figure was dwarfed by subscription revenues, which claimed 90% of Spotify’s $2bn+ annual sales with $1.95bn (€1.74bn). To spearhead the move, MightyTV founder Brian Adams is joining Spotify as VP, Technology. Interesting: Adams has been specifically tasked with ‘using his vast knowledge of programmatic advertising and personalized recommendations to further develop Spotify’s advertising products, as well as our own marketing technology platform’. “The content recommendation system MightyTV has built is incredibly aligned with how we think about advertising technology and marketing personalization,” said Jason Richman, VP of Product at Spotify. “Spotify has built the leading marketplace for fans and creators,” said Brian Adams (pictured). Adams he founded Admeld in 2007, a publisher monetization platform that was sold to Google in 2011. He then joined Google to run the Doubleclick Publisher Platform before leaving to found MightyTV in 2015. The MightyTV team will be based in Spotify’s New York City, Toronto and Stockholm offices.